I am hard pressed to think of a recent movie with as much baggage as Ender’s Game. The novel from which this movie is adapted is as academically reviled as it is critically acclaimed. In recent years, Orson Scott Card has become infamous for his ultra-conservative views on Obama, climate change, and gay marriage. The film’s theatrical release faced protests, boycotts, and renewed discussions on if/how a critical audience should separate art from the artist. I suppose the classy thing for me to is ignore those conceptual burdens and evaluate the movie on its own merits. Here is the setup. At some point in the near future, a race of extraterrestrial insects invade the Earth. Humanity manages to fend off the first Bugger Formic invasion, but in doing so the leaders of the world cultivate a considerable paranoia about the bugs coming back to finish the job. Even after half a century, Earth seems to be living amid a constant war economy. Part of this protracted psychological siege sees the International Fleet, a supranational military organization charged with defending mother Terra, scour the globe for child soldiers with the gift to be starfighters with the reflexes, and data processing abilities to coordinate a final and decisive battle against the Formics. Sound complicated? It can be at times given the movie’s tendency to alternate between being poorly explained and hideously over-explained. Nothing says narrative cohesion like having a teenager offer expository voice-overs just to make sure the audience picked up on the subtext of the previous scene. Yet for a movie that clocks in at less than two hours, the entirety of the plot feels rushed and under-developed, as if it were trying to cram a decidedly political, four hundred page novel, into a kid-friendly science fiction film. I know, I promised to treat this movie as its own cultural entity, but it’s worth mentioning that I doubt I would have understood half of what the movie was trying to do if I hadn’t already read the novel. The aforementioned issue raises one of the more confounding questions about this movie – perhaps even more confounding than the ending which, again, if you haven’t read the book won’t make any sense. Who is the target audience? Given the lazy way Ender’s Game treats child soldiers as a fait accompli, I can’t see it as a morality play for adults. With bullying, and tactical applications of bullying, as a recurring theme throughout the movie, not to mention the clumsy attempt to frame young Ender Wiggin (Asa Butterfield) and his battle school chum Petra Arkanian (Hailee Steinfeld) as a little more than ‘just friends’, I suspect writer/director Gavin Hood was truly aiming for a younger demographic. In terms of performance, there’s a distinct lack of emotion emanating from the cast as a whole. Certainly Ford, Davis, and Kingsley play their parts for all they are worth, but they are largely bit players amid an ensemble of young actors. Either through shortcomings in the script or a simple inability to act, most of the younger cohort come up well short of the emotional specturm one would expect from child soldiers. Only Moises Arias as Bonzo Madrid, the cruel commander of Salamander Army, brings the sort of volatility one would expect to see of a child given real power. This paucity of feeling even extends to Asa Butterfield as Ender. Again, I’ll lay most of my blame at the door of Gavin Hood. An actor can only do so much to save a character when the screenplay is an abysmal adaptation of the source material. Ender is all too often of a neutral disposition, save for at the very beginning and the very end. Even at the end, what should be the story’s highest point of tension, Butterfield is given neither the necessary screen time or dialogue to sell me on the requisite guilt that would come with enacting a genocide. Perhaps the only point in favour of this movie is the way it gives the International Fleet an international screen presence. There are at least as many people of colour in speaking roles as there are white people. Perhaps it’s not a big deal, but we live in a world where Hollywood put serious consideration into an all white, live-action version of Akira set in New York. I’ll take my diversity wins where I can get them. Without using the novel as a yardstick to show what this movie gets wrong, there isn’t a lot more to say about Ender’s Game. The screenplay presumes little sophistication or intelligence on the part of the viewer. Everything looks pretty enough, though I suspect Gravity ruined me on really appreciating any of Ender’s Game’s Battle Room scenes. More importantly, the screenplay makes no meaningful attempt at engaging with the IF’s use of child soldiers or humanity invoking the Bush Doctrine in their war with the Formics. 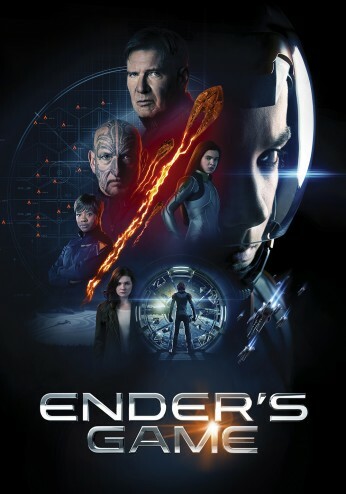 As a result, Ender’s Game comes off as a shallow affair that is primarily concerned with exploring standing one’s ground against a bully as a leitmotif for managing an alien invasion. Forgive me, but that’s a little dumb. In the end, Ender’s Game is utterly bereft of subtlety, nuance, or the moral ambiguity that – for good or bad – made the novel (in)famous. Stray Thought: A number of elements of Steve Jablonski’s soundtrack seem lifted from Ramin Djawadi’s tune from the opening credits of Game of Thrones.